So, being in the southern hemisphere, we are currently in the midst of our cooler months. Being close to the equator, we don’t get snow and sub-zero temperatures, but I sure have been feeling cold lately! I guess when you have only a few degrees of temperature change, your body feels each number. I was laughing on Sunday, because I was so cold I put on my knitted hat to help keep me warm, and the temperature was just in the low 60s. 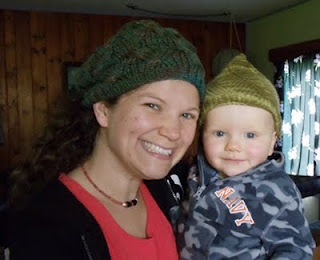 Here are Thad and I in our cozy hats knitted for us by my friend Melany! 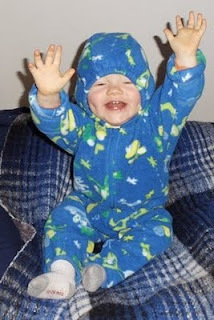 Thad is starting to be a bit more mobile in his bed at night, crawling out from under the covers, and rolling about. Since Jamie & I have about 6 blankets on our bed, I worry that he will get cold in the night if he climbs out from under his blankets—so we found a solution. We pulled out the polar fleece “suit” and have been putting him in that, along with his pajamas at night. We figure that’s got to be worth a few blankets (and so we’ve lessened the number of blankets we put on top of him)! He is so cute all bundled up in his “blue suit” – that’s got to be one of the best parts of being cold, seeing babies all bundled up.